Improving the overall appearance of your home can be more difficult than you think. Interior design is difficult enough, but dealing with various landscaping and hardscaping needs can be especially difficult. You're dealing with weather in addition to the means by which you can unify the overall appearance of the whole of your abode. Going it alone with landscape design is rarely advisable, especially since these considerations require an expertise and familiarity with various kinds of materials. Our team of landscaping and hardscaping experts can help you have a great looking home. Many people take for granted the impact that a stylish driveway or pathway can have. In fact, you can make a major statement simply by considering the overall look and feel of your driveway and any pathways as well. It's all of a piece, really, and you should never take such matters for granted when it comes to giving your home the look that you've always wanted it to have. Designing a great pathway or driveway goes beyond mere function. Ideally, function and aesthetics need be be considered together to make your driveway or pathway look its best. That means thinking about stone and materials as well as the plantlife and/or xeriscaping options available. This also means thinking about ways to make the most of the existing space and look of a driveway or pathway. Should there be an overhang of some kind? Shade? Other sorts of embellishments? Sometimes the existing driveways and pathways will just need a bit of alteration, while in other cases it may be best to create new driveways and pathways, laying down new pavers and stones or pouring fresh concrete. All such questions and concern will be seriously considered when developing a design concept. Ultimately what helps make these kinds of landscape and hardscape decisions is the look of your home. By considering the natural look and layout of the house, a good concept for pathways and driveways will present itself. It's important that designs styles complement each other rather than clash. This is something that can take years of experience to master, but this is what we are here for. Our team of design specialists have years of experience regarding all of these concerns. We will be sure to answer any and all questions that you may have about your options for landscape and hardscape matters. When we work with you, we will run a few ideas past you, but ultimately our goal will be to meet your needs and make sure that you feel happy about any and all decisions that are made. 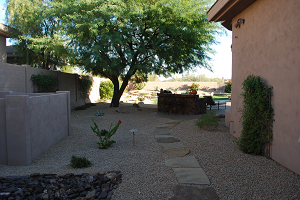 For more information about all of your options for designing a great frontyard and backyard, be sure to contact our Anthem, Arizona landscape design experts today. We look forward to meeting you in person and helping you realize all of your visions when it comes to beautifying the exterior of your home.